Most runners appreciated the lightweight nature of the Mizuno Wave Shadow. One runner expressed that he forgot that he had the shoe on because they felt natural and comfortable. A majority of testers appreciated the color combinations on the shoe. All of them said that the overall design of the shoe was made for a runner to stand out from a crowd. One user with overpronation said the shoe was fast enough, but could still provide a bit of support. A majority of runners mentioned that the midsection was tight. One tester said that the sole unit felt too stiff. He mentioned that it needed to be broken in. A reviewer noted that small rocks and sticks easily got stuck in the outsole. A lot of users felt that the shoe did not have enough cushioning. Mizuno’s Wave Shadow is a neutral running road shoe with a reasonable price. Donning this lightweight and colorful shoe allows runners to experience a softer landing with a more propelled toe-off while standing out from a crowd. It’s for runners who are looking for a stylish yet nimble companion for tempo runs, general workouts or short road races. The Mizuno Wave Sayonara is dead. Has Mizuno come up with an acceptable replacement? See the verdict below. So say goodbye to that shoe and say hello to its replacement, the Mizuno Wave Shadow trainer. Permit me to call it the Wave Shadow, for short. The Wave Shadow will be on sale in July. It weighs 8.8 ounces, slightly less than the 9 ounces of the Wave Sayonara. And it sports an 8mm drop; the Wave Sayonara had a 10mm drop. The Wave Shadow has a new and sleek, highly stylish look. The colorway is bright – as can be seen on the pair sent to me by Mizuno, and there are numerous fabrics and materials on the shoe, some of which prove to be fun to touch. The Wave Shadow looks like it should glow in the dark, and it does! The tongue on the Wave Shadow is gusseted. This might seem like a minor point, but in practice, it means that the tongue does not move around. Get the small details right and other things fall into place. If you’re familiar with the long-running Mizuno Wave Rider line, you will find the Wave Shadow to be more cushioned and less firm than the Riders that came before the current model. On the road, the shoe feels low to the ground and smoothly cushioned with a soft heel. If blindfolded, I would have guessed that this was a Zoot running-triathlon shoe. The Wave Shadow’s smooth, soft and flexible yet stable ride produces one unexpected by-product on city surfaces such as concrete and asphalt. This shoe is extremely quiet. No slapping, creaking or popping sounds here. Wow. As with its predecessor, the Wave Shadow is an exemplary pace trainer. Although the Wave Shadow is labeled as a neutral trainer, it is quite stable. I found that there was little foot movement while running in the shoe. Minimal pronators and many moderate pronators should be able to train and race without difficulties in the Wave Shadow. That grip lets you confidently plant a foot when turning or landing on some unexpected surface. The Wave Shadow provides for an excellent transition from heel strike on through to the midfoot landing and on to the forefoot. While midfoot runners and heel strikers will be able to run comfortably and confidently in the Wave Shadow, it may not be easy to run on one’s toes in this model. But if you’re a forefoot-bounding cheetah, stay tuned for our upcoming look at the soon to be released Mizuno Wave Sonic racing flat! The Mizuno Wave Shadow delivers on its promise of a soft, but tight and snappy ride. It’s a comfortable, stable shoe that will serve as a reliable daily trainer for most and should double as a half-marathon to marathon shoe for numerous runners. The Wave Shadow not only makes for a fine Wave Sayonara replacement, it offers enhanced build features, looks and ride quality at its $110 price point. Prior to continuing my review, I would like to give some background information for you to better assess my view. I am a mild overpronator and the Mizuno Wave Shadow is the first shoe that I run which do not target overpronators. As a comparison, I will refer other Mizuno models that I used; Wave Paradox 2 and Wave Inspire 12. Personally, I like word games. I am not sure whether it is intentionally or not, but Mizuno did a good job on playing with words by calling it new line “Wave Shadow” and select bright colors for the shoe. When I think about the “Wave Shadow”, I am thinking about a very fast shoe, with some dark, neutral colors. When I open the box, I see the bright yellow, orange, and green. The official name of my shoe’s color is “Safety Yellow / Red Orange / Jasmine Green”. The shoe is the next iteration of Wave Sayonara, being a lightweight daily trainer. In the near future, I am expecting to see a full black version of this model as well, maybe as a limited version to match the color with the name. Since Wave Shadow is the replacement model of Wave Sayonara, it shares similar attributes, around 250gr and using similar wave plate. However, Wave Shadow has lower drop than Wave Sayonara, 8mm vs. 10mm, which I believe is one of the most commonly used drop height in performance shoes. I am surprised with the performance of wave plate applied in the shoe. It is minimal when compared with that of other models; however, I did not feel discomfort with the lower support I received. My first couple of runs were mid-distance, about 8-10km each, and the shoe responded very well to my support expectations. After the runs, I did not feel any pain in my knees or on my hip. It is very clear that I felt the ground more, especially on the front part of my feet. This is a result of the lower drop of the shoe and this can create some disturbance if you would like to take the shoe for a trail run. I ran on an asphalt surface, therefore, cannot comment about using it on concrete or any other surface. The fit of the shoe is very predictable after I spent only a couple of minutes examining it. It gives you the feeling that it can provide you enough comfort. 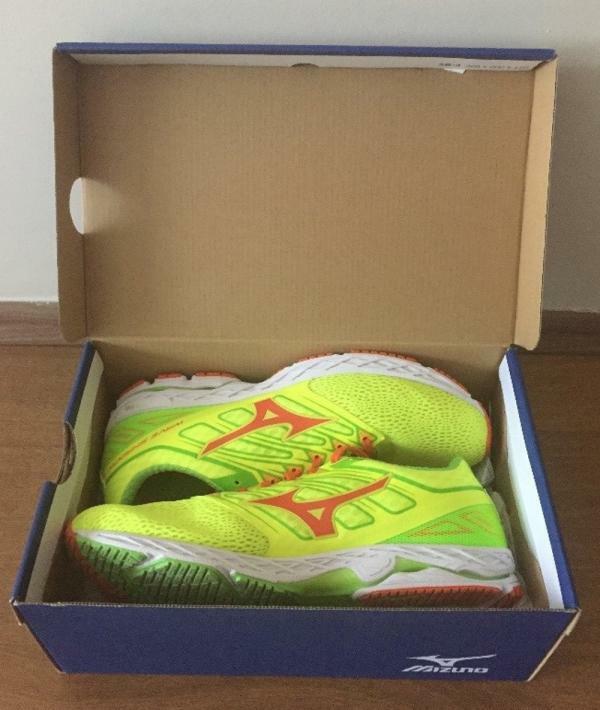 I picked exactly same size as my other Mizuno models and the shoe fits very comfortably. It also fits secure and close enough to the feet that you do not really feel the shoe when you put them on. The toe box is not narrow and provides enough space and comfort. In the midsole, Mizuno used a new material called U4icX, which creates a more bouncy feeling. I am not a material expert but I think this feeling is a result of the new material being softer than other materials in other models. The wave plate used in Wave Shadow is broader than I expected from a performance shoe, and it created enough support and guidance to me. I did not feel the stiffness of the wave plate, which I felt in other models, and it provides increased responsiveness. As an outsole material, Mizuno used X10 rubber. The sole of the shoe surprises me. I cannot decide whether if it's in a positive or negative way. The outsole has the design of a trail shoe with its small pods of rubber. At first, I think that such a design has to provide additional traction. Therefore, I decided to test this on a wet surface. During this time of the year, it is difficult to find a rainy day where I live, so I looked for some wet surface to test the traction. Even the test is limited of distance and repetition; I do not feel additional traction. However, to have a final verdict on this topic, I trust other people who have the chance to use the shoe on rainy days. The durability of the outsole meets my expectation; after I cover approximately 50km, I did not see any wear. As a conclusion, I can easily say that Wave Shadow is the one, which I will pick for my tempo runs. Wave plate provides enough stability and guidance for me during middle distance training, and cushioning was very satisfactory. The price level is very acceptable, 110 USD, for a brand which creates shoes that last up to 900-1000km. Call me foresighted maybe, but when I go to triathlon, I bring with me one extra cap (they give u always one), two t-shirts, two all (but bike and helmet), I take even two swim goggles with me. I always have a bad feeling that I would leave something behind. Regarding running shoes, the same thing applies. I always bring two pairs -one as a starter (a flagship) that I feel comfortable and fast and another one set as a backup that is not as fancy as the first one but can be used for a vast spectrum of situations. I could wear them no matter what race condition and still have a good performance. They are my Darren Sproles with the Philly Eagles, not the best RB, not a WR but more than just an OW. With that being said, I introduce to you my new Darren Sproles, directly from Osaka, Japan instead of Waterloo, IA, the Mizuno Wave Shadow I.
I made a lot of kilometers with these shoes, close to 300 km. I brought them in road races, city ones, triathlons, through the forest, dry and wet conditions. Therefore, the shoes are quite “used” but not wasted, so are the pictures. I have to say that my first thought was putting my sunglasses on. That super bright neon yellow color is awesome and a head turner. When you see this shoe in a catalog, it looks neon yellow, but it's less bright in person. The upper is an engineered mesh which is quite comfortable and well-structured. It could have been more flexible, but that’s ok. The midfoot is reinforced at the laces zone in a very clever way, so the Mizuno logo helps as well with this endeavor. The heel region feels rigid at the beginning but becomes comfortable in the long run (even without socks). One of my first impression is that the foot feels comfortable and protected. But for people with wider feet, this could be a problem between the upper and front. I tried it without socks, and the result was quite satisfying. Sometimes when u run without socks (like in triathlons), the midfoot region suffers a lot from blisters at the midfoot region due to that sock conformation (between the sole and the upper) that some actual brands are using. Overall, this is recommended for any runs, easy jogs, and fartleks. I admit that if I had written this review after less than 50-75 km, this review could have been much, much less positive. Therefore, I strongly suggest to train and be patient with these shoes. You have to train and "tame" them. The wave works at the end of the day, but it's somehow pretty stubborn. It means that this plaque/technology/whatever you want to call it, is somehow a plastic piece under/between the sole. It's rigid at the beginning but becomes more and more comfortable as you run with them. It somehow evolves with your running performance to the point that it's quite comfortable and versatile. From quite a rigid shoe to an evolving material, an entirely comfortable one. I checked out some other wave shoes (maybe I was wrong, who knows), and I saw that it's quite common with the wave technology. I recommend 50-75km, around two-three weeks of training. I broke in with a sprint triathlon and an Olympic Duathlon. I recommend the paces around 4-4:30 for these shoes. If you go slower, maybe you could have problems with the wave as it goes some nervous touch at slower paces than 5. If you run at higher paces (faster), maybe you could go for lighter shoes. It's best performance scenario would be an Olympic triathlon, where I move around those paces, 4-4:30. The good padded inside and heel zone are well ventilated and fresh. You feel the wind at the forefoot/heel zone when you are running. The heel zone is quite comfy and despite is has some flexible zone as depicted, the whole behavior holds on pretty well. Without socks, it sometimes turns warm inside due to sweat-mediated-overheating and the padded inside but just to mention, not a big deal. The default laces are elastic and quite good compared with other default ones from other companies. I changed them into normal elastic ones due to triathlon issues. Sometimes I give away the pairs I receive after testing it, but this time I'll keep them. It's always good to have some Swiss knife inside the wardrobe, who knows. After 200 kilometers I realized that there is some reinforcement zone at the front foot that sometimes hits your nail and may cause some blisters at the big toe. This region is oriented to offer extra protection when you run barefoot. After 200 km we checked that could be a weak spot (not the region but the interphase between them). The Wave Shadow falls right there with the Kinvara 8, the Luanch, other shoes; they call it up-tempo. The outsole of the shoe is made up of a highly durable rubber which Mizuno calls X10. It’s specifically designed to cover areas that are prone to wear and tear. Aside from its protective characteristics, the X10’s rubber pattern on the forefoot area on the outsole aids in a more effective toe-off. Another major feature of the Mizuno Wave Shadow is the U4ixC midsole which is mainly responsible for the amount of cushioning and the level of response. The midfoot design aids in creating a comfortable yet springy experience for the runner. On the upper is the Dynamotion Fit which optimizes the snugness of the shoe using separated panels combined with stretchable mesh material on the forefoot. As the name suggests, this material moves with the runner’s foot at every phase of the running gate, ensuring a more secure and comfortable fit. Mizuno’s Wave Shadow comes in standard shoe measurements. It comes in the usual sizes for runners so those interested can make use of their usual size preferences. The same can be said with the shoe’s width. B-medium is available for females while D-medium is available for males. Mizuno’s X10 rubber makes up the outsole, which is also used in the Wave Shadow 2. It’s a highly durable carbon rubber material that protects the bottom of the shoe from deteriorating at a faster rate. Because of its anti-abrasive qualities, it is placed on areas underneath the shoe that receive a higher impact upon landing, thereby prolonging its optimal state. This rubber material’s pattern was designed with lines and zigzag indentions, strategically separated into sections. These specific segments allow the bottom of the shoe to move together with the runner’s every stride. As the foot bends and expands, so does the entire shoe, thanks to this specific tread pattern. On top of that, the indented lines and zigzags supply the shoe with the right amount of grip and traction, especially during toe-off. Runners don’t have to worry about slipping and sliding on common surfaces that runners tread on. Mizuno has different variations of Wave units that provide different benefits. On the Wave Shadow is a parallel wave plate which can be observed on the lateral side of the shoe’s midsole. This specific plate was designed to give enough cushioning and energy dispersion. It also permits the foot to move more naturally. Most of the midsole is made of a foam called U4icX. Mizuno designed this material to be lightweight and able to deliver plenty of energy return. This complements the wave plate very well, augmenting the benefits both features strive to deliver. The upper sports different shoe features that permit a custom fit. Starting with the Isofit, this system is composed of two key properties of the shoe – the sock-like construction combined with the unique lacing system. The sock-like construction that’s made of stretchable mesh hugs the foot in all the right places. Because it has elastic characteristics, it molds to the shape and size of the foot with ease. This material aims to provide comfort with its soft feel and non-restrictive coverage. In addition to the mentioned benefits, this material is also made to provide ventilation. Because it is made up of mesh, air can easily pass through the network of wires, allowing the heat to escape and the foot to breathe. 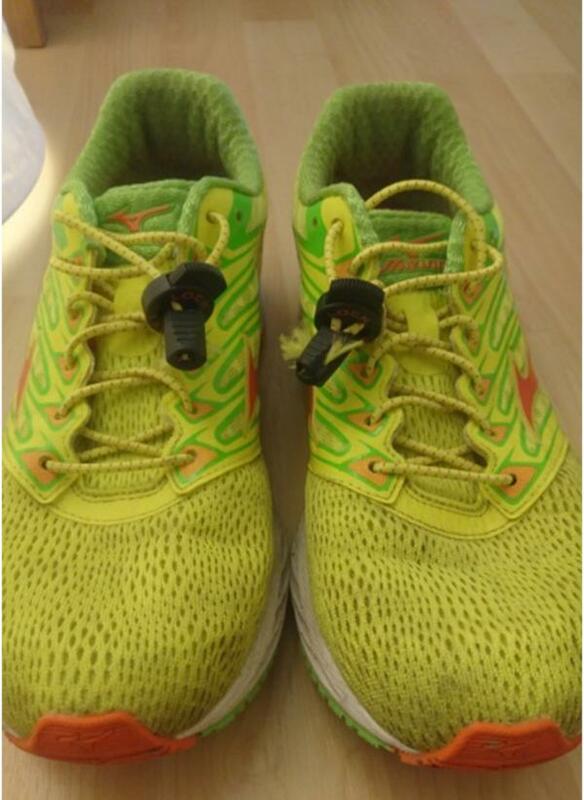 The second component of the Isofit system is the lacing which is connected to bands that extend from the eye-stay of the shoe. Tightening the lacing will also tighten the bands. This produces a more secure fit on the middle part of the foot. To lightly support the structure of the shoe on the midfoot, Flex Film Overlays were added. These overlays are not just for aesthetic purpose. They slightly enhance the security and snugness delivered on the midfoot without compromising flexibility. The films are also reflective, allowing better visualization when running in low lighted conditions. The collar lining of the shoe helps with absorbing moisture. Saucony lined it with Rundry, a lining material that has superior wicking properties. Aside from that, runners are given the chance to benefit from the plushness of the material.